Printing of artwork details and associated images is primarily managed from the Artwork Component. But many of the reports in Tessera also print artworks in several formats. Details can also be exported from the Print Screen meaning you can edit details in an external word-processor or page-layout application. Find the artworks you want to print. Access the Tools Menu and select Print. Or use keyboard shortcut CMD-P on Desktop devices. Create templates to control what details are included and what design is used when the artworks are printed. 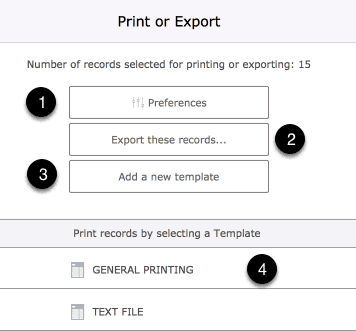 If you want to include Collection numbers in the printed result use the Preferences to specify the Collection numbers that will be used. Records found can be exported instead of printed. See details on exporting artworks. Create a new Template to get started. Select a template to print the found artworks or to edit it’s settings. Enter the text to be displayed at the top of the printed report. Make a selection from the designs available. Enter the text to be displayed at the top of the printed report. Details of the header are also shown on screen as a reference. 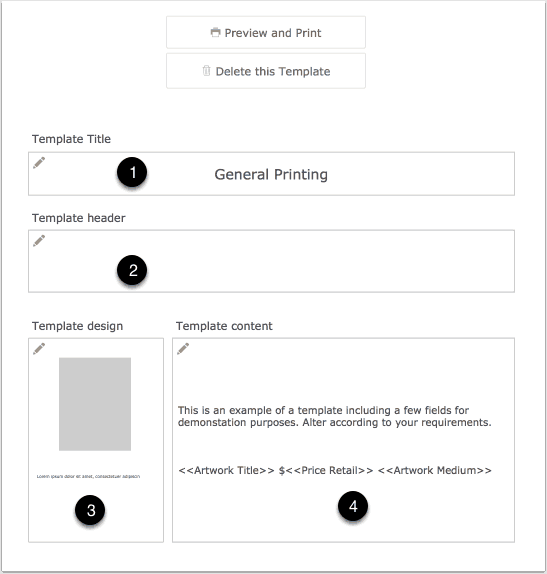 Use the Template content button to select and enter details you want included alongside each artwork when printed.